Local shadow puppeteer, Zannie Fraser has kindly given us these tips to put on our education page! Shadow puppetry is different from other kinds of puppetry in that the puppet itself does not work in isolation. 1. The Puppet- or something to cast the shadow: This can be a traditionally made puppet which can be either a simple black silhouette or very colourful and intricate. You could also use an interesting shaped object like a doll, a sieve or a twig. Or you could use yourself or part of yourself to make a shadow. A group of people working together could make some strange and wonderful creatures in shadow! 2. The Screen- or something to 'catch' the shadow on: This could be a sheet made of fabric or paper. Your screen can be hung up or simply held taut by two people. The screen can be large and can be fixed to a large frame or to lighting stands or an easel or you could make a very small screen and attach it to the front of a cardboard box. It could be floating free to create ripple effects or held by hand and moved about the space to ‘catch’ the shadows. If the light was in the right place, you could even use a plain wall or the floor as your screen. 3. The Light: You can use simple domestic lamps or torches (if your room is dark enough)! Or, if you have one, an over-head projector can be used to great effect because you have the flat, glass surface which things can be placed on to create backgrounds, and you have the vertical space for your puppets to move in and cast shadows from the light. Using an over-head projector is a great way to combine your shadow puppets with simple shadow scenery and settings. And don’t forget the biggest light of all which is the sun! On the right day you can create a wonderful outdoor shadow show using the bright light of the sun to cast your shadows! I hope this has given you some food for thought. Why not go on a shadow hunt to collect ideas for your own show! 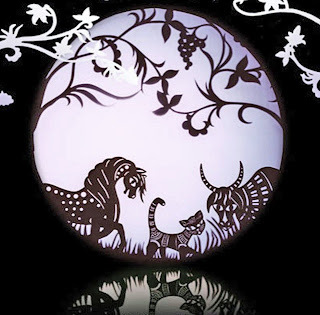 Below are a selection of clips that reflect the breadth of Shadow Puppetry worldwide. Or why not put them on Norwich Puppet Theatre's Facebook page HERE. However there is also a strong and ancient tradition of shadow puppetry from Turkey. Karagoz (meaning 'Black Eye' in Turkish) and Hacivat (meaning 'Cevat the Pilgram') are the lead characters in traditioanl Turkish shadow plays. Karagoz is a mischievous character (rather like 'Mr. Punch') and Hacivat is always shown as an educated, more level-headed character. Karagoz always manages to outdo Hacivat with his quick wit, but he is too impulsive and his schemes always end in failure! This next clip shows an interesting mix of long shot, medium and close up puppets in the same performance. If it's a professional dance company you want to see with some amazing shadow performance check this next clip out! And last of all, this clip shows some simple ideas for articulated shadow puppets and stage sets and demonstrates how a laser cutter can be used to cut out the shapes.